Get Your Lucky Cash Today! You have survived the wind, the snow, the ice, and the cold. You have earned a chance at having a lucky day in March! 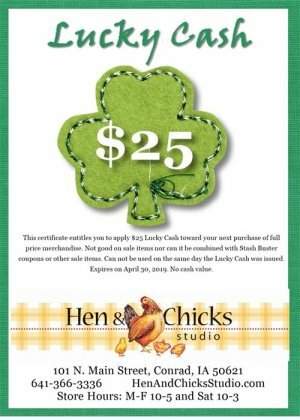 * Spend $75 (before taxes) or more on anything in the store during your visit to Hen & Chicks Studio in March and we'll give you a $25 LUCKY CASH certificate (similar to the one shown above). * Then, make a return trip to Hen & Chicks Studio before April 30 and put the entire $25 Lucky Cash toward a purchase of full-price merchandise. Q: Are there rules that apply to using your Lucky Cash? A: Yes, but just a few! You can not use the Lucky Cash in combination with your Stash Buster coupons or other sale items. You can not earn additional Lucky Cash from the purchase you are redeeming it in. If you do not spend the entire $25 Lucky Cash you will not be able to keep any remaining for future purchases nor will you get any cash back. Q: How many Lucky Cash Certificates can I get during the month of March? A: As many as you want! Everytime you spend a full $75 pre-tax, you'll get $25 Lucky Cash. So if you spend $149.99 pre-tax you'll only get one $25 Lucky Cash, but if you spend $150 pre-tax you'll get TWO $25 Lucky Cash certificates. Spend $225 pre-tax and you'll get THREE $25 Lucky Cash certificates. I know you get the idea. Q: Can I cash in my Lucky Cash all on one purchase? A: Yes! Just remember you can not use your Lucky Cash the same day you earn it. And it must be used on full-price merchandise. Lucky Cash can be used on paying for retreat fees, but can not be used on classes. So, you can't buy an item with your Stash Buster coupon and then use the Lucky Cash to pay for the remaining balance. And, you must use your Lucky Cash all in one purchase. You can not use $10 during one trip and $15 during another trip. And, if your item is less than $25 you will not get the difference back in cash. Q: Is this the March Red Bag Club Special? A: Yes! And, if you're not already a Red Bag Club member the $75 purchase qualifies you to become a member! How lucky are you! Q: How many times can I come in and earn Lucky Cash in March? A: 26 times. (31 days in the month minus the five Sundays we are closed=26 days for you to come in and earn Lucky Cash). Shopping therapy may be just what you need after all this snow and we are here to help you get out and about and rejoice that Spring is coming soon. Have other questions? Email Heidi!